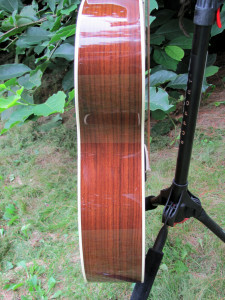 Pros: Wonderfully executed design, with top notch resonance and purity, and top shelf tone woods inlaid with pearl at a reasonable price, especially compared to Style 45 Martins. Cons: Discontinued. They were planning a Madagascar rosewood version, but when the economic crisis struck, the changed their minds. They made it, but they slapped Eric Clapton’s signature on the fingerboard and offered them only in Japan for a king’s ransom. Bottom Line: One of the finest Indian rosewood fingerstyle guitars Martin ever made. When I first saw this instrument at the Martin factory I was genuinely surprised. The fabulous 000-42 had only recently entered the Standard Series line of guitars and none of my insider sources at Martin had ever mentioned this new 000-42 Marquis. But then, nothing could have prepared me for how absolutely blown away I was by this guitar, one of the best C. F. Martin has come up with since the Second World War. 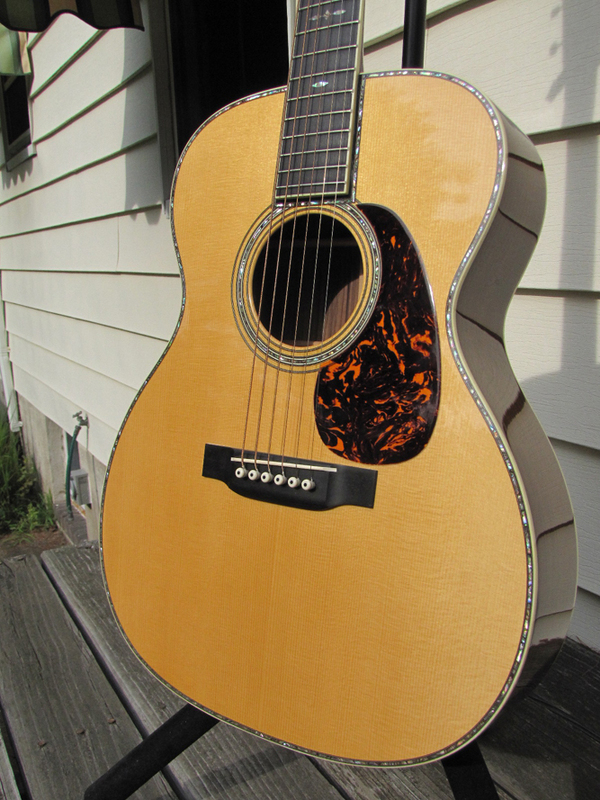 With its first rate Indian rosewood and pearl inlaid, premium grade Adirondack spruce top, supported by light, 1/4″ bracing, forward shifted in the pre-1938 fashion for even more resonance, this relatively small guitar sounds huge and magnificent. “Astonishing” would not do it justice. 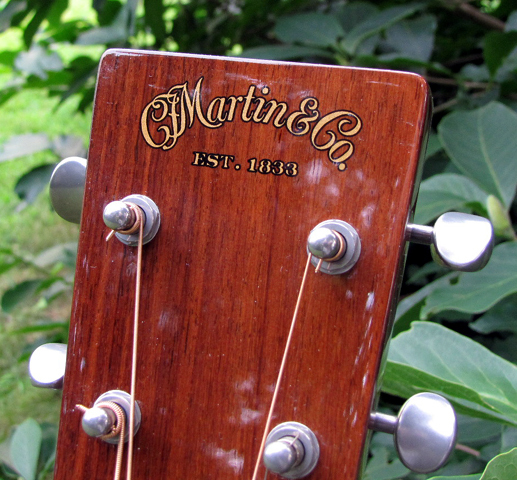 The instruments in Martin’s Vintage Series pay homage to the classic guitars of the 1930s. The Golden Era models came later as genuine attempts to offer more-accurate replicas, with the exception of some modern conventions such as an adjustable truss rod, contemporary glues and so forth. 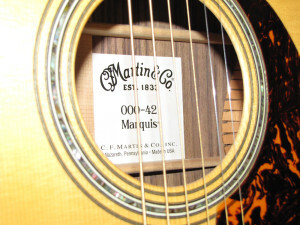 The Marquis line of instruments came into being when Martin had to restrict their Golden Era editions of rare, Brazilian rosewood. So they offered the same dreadnoughts and OMs with the same construction and appointments, only with Indian rosewood for the back and sides. But this new 000-42 is the first model designed expressly for the Marquis line. They couldn’t have picked a better one. But what really makes the 000-42 Marquis extraordinary is found in its top wood and the braces underneath it. 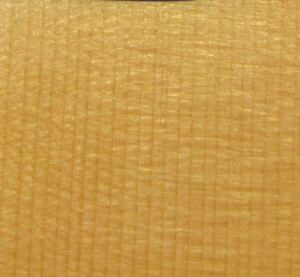 Where the modern 42s are made with premium grade Sitka spruce, which accentuates the warm, lush and powerful aspects of Indian rosewood, the Marquis guitars get premium grade Adirondack spruce, which accentuates high harmonics and brings a bell-like clarity to all registers of the guitar’s voice. When you put that spruce on serious rosewood and inlay the edges of the top with pearl you skyrocket into the stratosphere of complex, sophisticated tone. 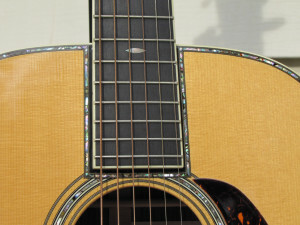 I subscribe to the opinion that inlaying the edge of a guitar’s top with dense, abalone shell results in an increased complexity to the voice that is often described as an added shimmer or jangle. 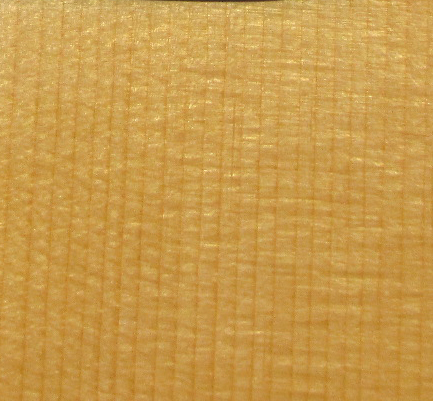 It simply isn’t present in guitars inlaid with wooden herringbone or thin plastic lines. All one has to do to experience this is play a Clapton 28 and a 000-42 side by side. The only difference is the pearl inlay. If they then play another model made in Style 42 side by side with its counterpart in Style 28 or 35 they will find the same tonal qualities present in both 42s and find them equally different from those non-pearled guitars. But when comparing pearly Martins, the differences are heard from the different spruces. 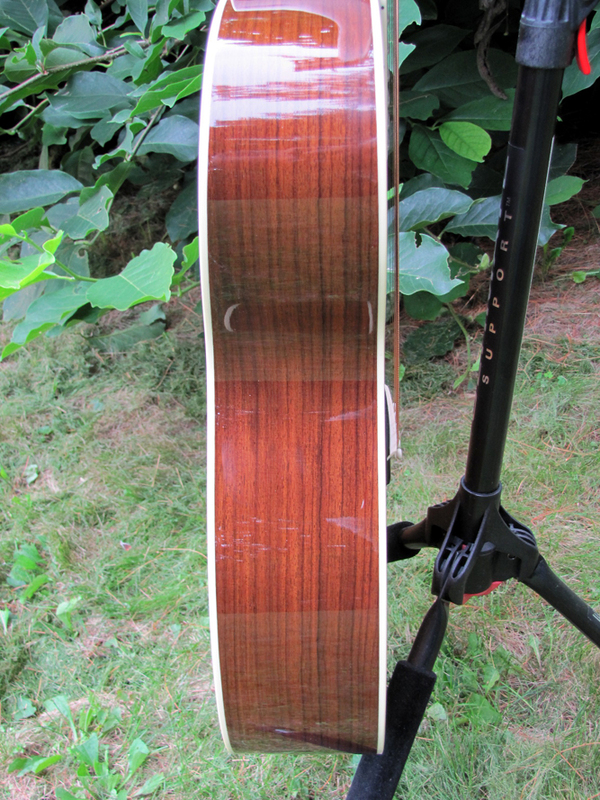 Where the Standard 000-42 has a wonderfully warm ring, that is a marriage of the smoky, Indian rosewood undertone and the beefy harmonic overtones of Sitka spruce, the extra clarity brought into the soundscape by the highly-reflective Adirondack on the 000-42 Marquis is truly breathtaking in how it accentuates the undertone swells while showing off that extra, pearly essence. What contributes even more astonishing vibrancy to the Marquis’ voice is the use of scalloped, 1/4″ top braces normally found on long-scale OMs. The short-scale 000 has the same body size, but since 1934 has had thicker, 5/16″ braces. The mahogany 000-18GE was the first regular production 000 to employ the thinner bracing, when it appeared this time last year. 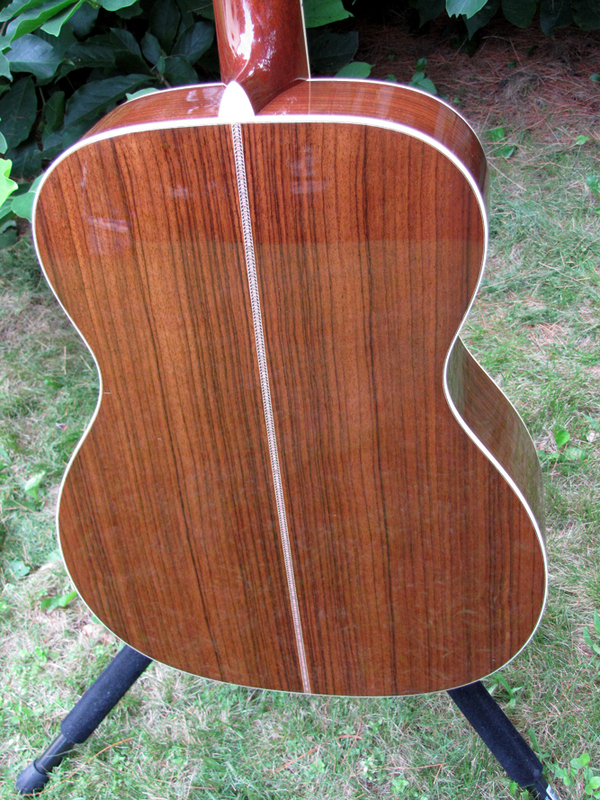 Now this rosewood 000-42 Marquis has followed suit. Although 1/4″ braces are not historically accurate on a 000, they allow the top to resonate more freely so the tone mimics that of the true vintage 000s, which were built with a lighter overall construction than used today. The results must be heard to be fully appreciated. 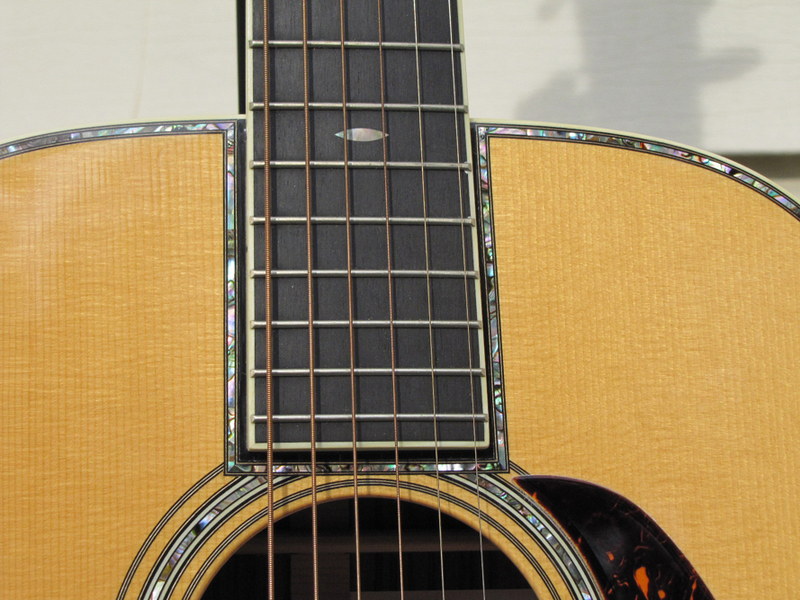 So now Martin has two short-scale, 14-fret 000-42s from which to choose: The Standard, with its extra pearl inlay and its warm, powerful Sitka top over 5/16″ braces that promote a focused clarity and forward projecting voice, or the Marquis, with its time capsule looks and vibrant, bell-like Adirondack top supported by the lighter 1/4″ bracing that lends itself to a more open, expansive and glowing resonance. I do not envy someone having to choose between the two. 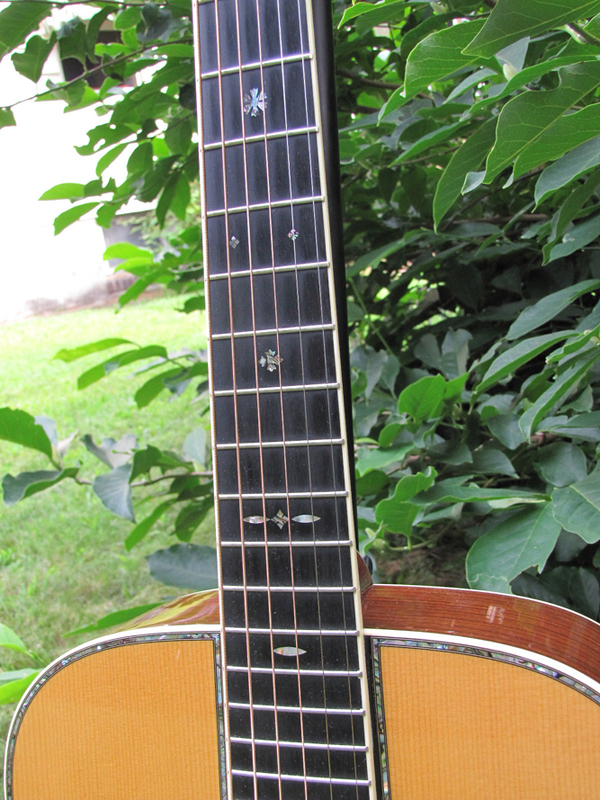 When answering an email asking how I would compare this new 000-42 Marquis to the recent and very impressive 000-18GE, I put it along these lines: The 000-18GE is an angel’s breath kind of guitar – clean, clear, open and forthright. The 000-42 Marquis is an archangel, with a flaming sword of righteousness in one hand and a silver trumpet in the other, overlooking a luscious, ever-swelling undertone. With those vibrant fundamentals and glorious harmonics, it is a pirate’s chest of dark, rich wood, filled to the brim with glittering jewels, swaying to and fro at the bottom of a coral sea.